it's no wonder i'm so in love with paris. they do best the things i love most: wine, cheese, and despite the french's rep for being meat-tastic, they really know their way around vegetables and treat them properly. on day 10, i saw the professionals. le timbre is the cutest and tiniest little bistro on a cute little street. but the food is serious. for dessert we had their "timbre napoleon" pictured above (fantastic), my partner had a different kind of escargots, but my braised endives (both below) might have been one of the best things i ate on this trip. properly braised so that they were caramelized at the edges and cooked perfectly all the way through, and i think finished under the broiler maybe because there was some golden cheese on top as well, as pungent as a roquefort. i have been obsessing about this since i ate it so i'm going to try to recreate this at home this week. the last time i stayed in paris, i was living a few blocks away from quatrehomme and i never knew it. which is good and bad. bad because i could have tried a different new cheese every day and probably really learned a thing or two. bad because i would have gained a lot more weight than i did. this time i went specifically for the fontainebleu–fat content 60% according to the internet. i ate this whipped cream-like cheese (picture the top of a soft serve vanilla cone but 1,000 times softer) in huge scoops. the last time i stayed in paris, i was living around the corner from this wine shop, which was all good. on thursdays when the restauranteurs would come in to buy their wines, the shop would have a tasting of the weekly features. this is where on this visit as with the last, we bought all of the wine we'd cart back home. the staff are all experts of course, and very sweet and helpful so it's easy to choose great wines from this store. and these photos tell you a little bit about the selection. finally made it to le chateaubriand, newer sister resto to la famille, on one of our last nights. i love them for not flinching when i asked them to do their 5-course tasting in vegetarian form (on the phone was one thing but in person, i sometimes get "…ohhh…"). i love them even more for making each dish amazing and not making me feel cheated for a second. 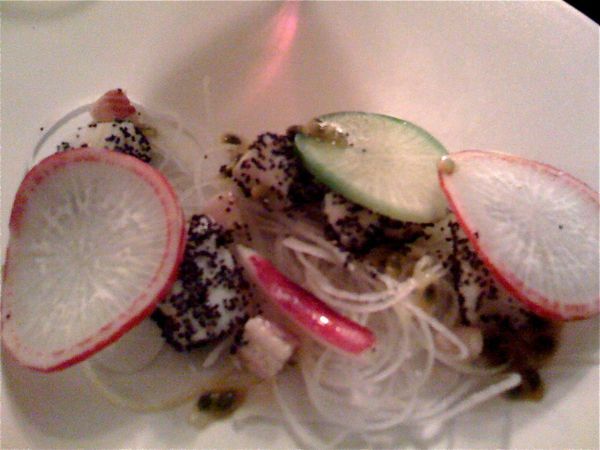 above was one of my partner's courses or poppyseed coated scallops and heirloom radishes. below, a young radicchio and endive salad with fresh burrata! god, how i love burrata and i almost never get to eat this salty, gooey cheese of the gods. the green salad with raw olives and an onion sambol gave me many ideas (hello! new use for lunu miris!) i had to finish with the cheese option–i had reason to believe it would be good. my companion always goes for sweet and we were wowed with the mint/basil/chocolate dessert. mint ice-cream on a white salt wafer, with chocolate and a sweet basil puree.